The most recent race I've run is the Gasparilla Distance Classic Marathon relay in Tampa on Sunday, February 28th. The 26.2 mile course was split up into 4 legs ... 1st leg was run by Chris (7 miles), I ran the 2nd leg (7 miles), Lenarz ran the 3rd leg (8 miles), and Ryan was our caboose running the 4th leg (4.2 miles). We finished in 3 hours 28 minutes and 3 seconds, 2 minutes faster than what we had originally estimated. The fact that we even finished is still surprising to me based on the amount of drinking Chris and Lenarz did the night before at Channelside. We got into town late Saturday afternoon to pick up our race packets. After doing that and checking into the hotel there wasn't a whole lot to do before dinner. So naturally we decided to start drinking. Ryan was lucky enough to avoid these bad decisions since he was having dinner with his dad in St. Petersburg. Chris, Lenarz, and I started off with a pitcher of sangria. I slowly drank my first and only cup as they chugged away the rest. Next we went to Splitsville (bar/bowling alley) and ordered a bucket of Yuenglings. I once again slowly drank my first and only beer while simultaneously drinking water. 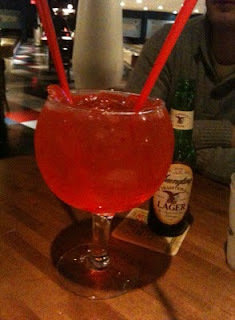 At this point the boys were buzzed and figured the next logical drink choice was a fishbowl. The server was thoughtful enough to bring 3 straws. It was the worst tasting girly drink ever. The boys seemed to like it and killed it in a relatively short amount of time. By this point I figured it was a good idea to find dinner options and end the binge drinking. We headed back to the hotel and settled upon Champions sports bar (cheapest place to eat). While we waited for a table Chris took it upon himself to order MORE drinks. This time I didn't even entertain the thought of drinking and stuck with water. The menu was full of normal bar fare, including many deep fried options. I stuck to what I knew and ordered the cheeseburger sliders, add bacon. Along with this scrumptious meal came a slew of perfectly fried onion rings. Although I didn't wash it all down with my usual Coca Cola it was still a close to perfect pre-race meal. The next morning at 5:00am the alarm went off and it was time to start getting ready for the race. The early start time of 6:00am brought very cold weather, no sun, and high winds. By the time I saw Chris at the 1st exchange point I was downright frozen. Running 7 miles definitely helped to warm me up. My leg of the race had some uphill portions but by the time I started running along Bayshore Blvd. it was all worth it. The sun was out and the crowd of onlookers pumped up the runners. I saw Lenarz at our exchange point and gladly passed on the timing chip that had been wrapped around my ankle. He took off running and I headed back to the start/finish line area via the shuttle. The best part of this race was being able to finish as team. Lenarz and I found Ryan before he reached the finish line and jumped onto the course just in time to sprint to the finish line. We got our medals, high-fived each other, yelled at Chris for not participating in the finish with us, and headed back to the hotel. Another successful race, due largely in part to the delicious cheeseburgers I ate the night before.